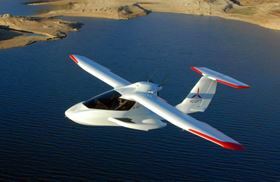 The ICON A5 two-seat amphibious light sport aircraft has a carbon fibre composite airframe. The aicraft has a wingspan of 34 ft and is 22 ft long. The ICON A5 has a lightweight carbon fibre composite airframe. ICON's strategy is to outsource the composite structure manufacturing of the ICON A5 to take advantage of the capabilities already existing in the certified aircraft sector, rather than recreating them. This strategy allows ICON to focus on the remaining development of the production aircraft design, while controlling all final assembly, system integration, and testing. ICON will receive major composite structural assemblies from Liberty and Flytech and will control all system installation, final assembly, finishing, and testing prior to delivery. A5 production will be at ICON's facilities in California. Liberty Aerospace currently manufactures the FAR Part 23 certified XL2 two-seat training/touring aircraft which has a carbon fibre fuselage. Flytech has been manufacturing composite aircraft tooling since 1983 and composite parts since 1996. Partnered with its sister company, Aeroplastic Kft., a specialised composite mould production shop with a history to 1983, Flytech offers a single facility for all composite needs from CAD model to finished composite part. Flytech has produced parts and assemblies for European aeroplane manufacturers including Diamond Aircraft, Comco Icarus and Remos Aircraft. "The proven track records of both companies in high-quality composite production drove this decision," says Kirk Hawkins, CEO and Founder of ICON Aircraft. "At ICON, we do our homework to ensure we get to great solutions - and this is just another example. Partnering with established suppliers will allow ICON to not only reach production sooner, but also accelerate the production ramp to meet the impressive demand we're seeing for the A5." ICON Aircraft is a consumer sport plane manufacturer founded shortly after the Federal Aviation Administration (FAA) enacted regulation changes in 2004 that created the new sport flying category. North Thin Ply Technology (NTPT) has celebrated Solar Impulse 2's successful completion of the world's first round-the-world solar-powered flight.